It is not strictly necessary to have a permanent wideband installed on your car in order to run a standalone ECU like the ME221/ME442. Most chassis dyno facilities will have equipment to measure the air/fuel ratio (AFR) so they can accurately map the fuelling requirements of the engine. However, if you are considering tuning parameters of the map yourself (Cold Start Enrichment, Acceleration Enrichment (AE), Injector deadtime etc. ); or want to set up more advanced features like closed loop fuelling; then it is about the most useful tool you can own. 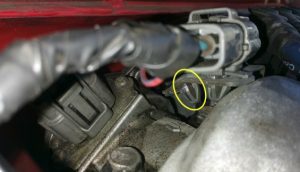 The Narrow Band (NB) sensor in stock MX5’s is limited to detecting a stoichiometric AFR, so is only useful when tuning for idle and for light load cruising where the target AFR is 14.7:1. The stock ECU ignores the NB signal when a medium-high load is detected (13.5:1 target AFR), when the engine speed is greater than 4500rpm, or if at full throttle. A Wide Band (WB) sensor allows accurate AFR detection in the region of 10-18:1 and therefore can be used at any load - allowing the optimisation of fuel for all areas of the VE table. The AEM wideband system consists of the sensor and its loom, and the gauge and its loom. The sensor in the exhaust sends a signal to the gauge (which has an inbuilt controller); this controller then converts that signal to a 0-5V voltage and sends it to the ECU. For the gauge to function it needs: a 12v power supply, a ground, and an input from the sensor. If you want to connect an output to the ECU, the WHITE signal wire from the gauge must be connected to the original narrowband signal wire which then in turn will head into the ME221 on the O2 Signal line. First step, disconnect the battery. Unplug the OEM Narrowband signal wire, the single black wire connector above the cam angle sensor. Pushing the connector together before attempting to pull it apart makes the task easier. It is sometimes necessary to remove the connector from its bracket first; a pair of needle nose pliers can be used to depress the ears. Using a 22mm spanner, take out the old NB sensor. If it is stuck, cut the signal wire close to the body of the sensor and use a six sided deep socket. 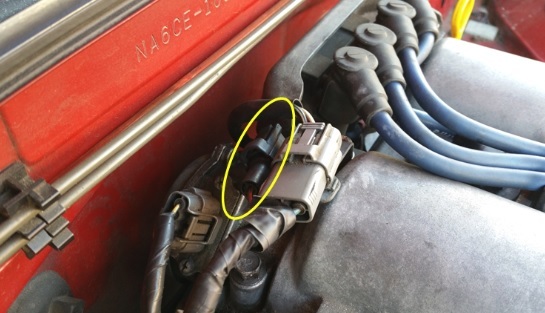 Install the AEM WB sensor in place of the stock sensor, being careful to rotate the signal wires as you thread it in to prevent the wires from binding up. The AEM sensor will come with an anti-seize compound and a crush washer already in place. The tail of the connector can then be routed through the engine bay to a hole in the firewall. The unused air-con holes were used in this install; there is a loom grommet next to this that can also be used if you still have air-con. Gauges can either be placed in gauge pods, in a blanking panel that cover part of the centre console, or in MX5’s they can replace the eyeball vents. To fit the gauge in the air vent, first remove the eyeball assembly; the gauge will sit in the housing, replacing the “eyeball”. The most tedious part of the entire install is separating the vent housing; the four opposing tabs need to be depressed in succession while working the face ring off of the housing. It really doesn’t want to come apart, but it will with perseverance. When the eyeball is out, snap the face back on and test fit the gauge into the vent housing. If the gauge doesn’t seat in all the way a half round file can be used on the sharp inside edge of the face ring; only a tiny amount of plastic should need to be removed. Lastly, a piece of rag or sponge should be placed in the vent to prevent hot air from reaching the gauge. To get the two looms into the air vent, a hole has to be drilled. 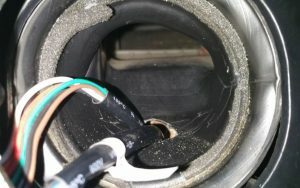 The wires come up from behind the centre console and the white connectors can be passed through; a small round file can be used to widen the hole if the drill bit is not big enough. 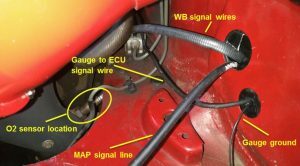 For hooking up the wideband sensor signal wires, it is as easy as plugging one end to the wideband sensor connector in the foot well, feeding the loom into the vent, and plugging it into the back of the gauge. Now the gauge can be wired. 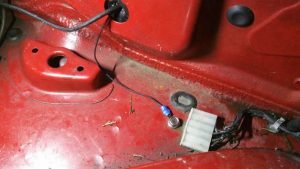 The red power wire is connected to an ignition switched 12v power source; it should have a 10A fuse protecting it. The black earth wire can be grounded in the engine bay. 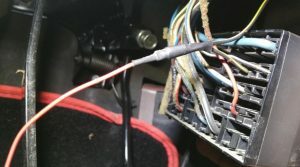 The white signal wire can be connected to the original narrow-bands signal wire for the easiest route to the ECU. And the blue signal wire is not used. The first step is to cut the excess insulating sheath off the loom, so the wires can go their separate ways. Cut it so the red wire can head towards the interior fuse box, the black and white wires can head to the engine bay, and the blue wire can be tucked under the dash. A source of switched power is the 10A meter fuse (Mk1); this controls the reverse lights and (fittingly) the instrument cluster. Look for the thin black and yellow wire coming from the back of the fuse block. To gain more access, remove the two Phillips screws holding the fuse block in place, and also the metal bracket that it sits on. The red wire can now be tee’d into the blk/yel wire. This install was done with crimp bullet connectors to make removing the gauge easier. The connectors were taken out of there bulky insulation and instead covered with heat shrink. Heating the connector’s original insulation will cause it to expand, and the bare connector can be pushed out. It is suggested that you cut further away from the fuse block than in this picture, to give more room to work with. The black ground wire can be fed through the firewall in the same place as the Wideband sensor wires. A ring terminal can be used to attach it to the earth block to the right of the washer bottle. The white signal wire from the AEM gauge is fed into the engine bay, the same as the earth wire. Attaching it to the original narrow-band signal wire will connect it to the correct pin on the ECU. Cut the connector from the end of the narrow-band sensor and splice it onto the signal wire, making sure it can still reach the other half of the connector by the CAS. For details of which wire is the OEM signal wire, check the hardware install guide for your model. 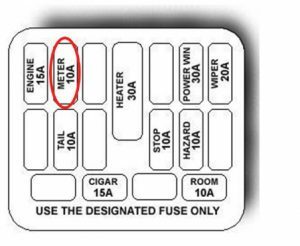 Locate the correct pin at the ECU connector, and use a multi-meter in continuity/beep mode to confirm which of the four original wires goes to that pin. A table is given below detailing what we have noted to date for different models - though always meter it out to be certain! Finally, connect the two looms into the back of the gauge, cable tie the excess wires up behind the dash, reconnect the battery, and the gauge should be fully functional. Notes: Four Wire Sensor. 12V Power can be gained from the Black/Yellow wire. Ground is Black. Notes: Four Wire Sensor. 12V Power can be gained from the Black/White wire. 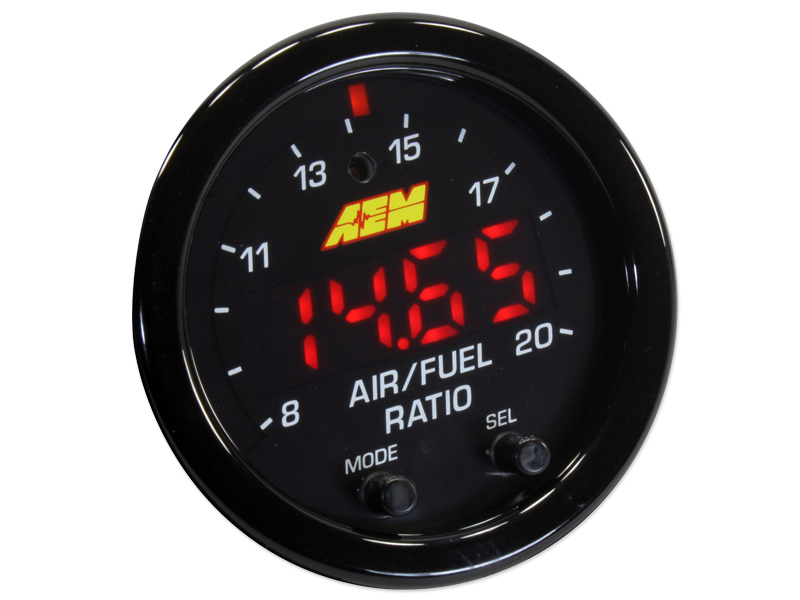 The AEM gauge can be configured to output different signal types to match the ECU’s required signal type. This is done by turning a rotary pot on the back of the gauge; the AEM instruction manual gives a diagram of the various positions. If the gauge has power it will display the output type as the dial is rotated. It will also display its output type each time it is powered on. Positions P0 and P1 both output a 0-5V signal that is compatible with the ME221/ME442. P0 makes the DRO of the gauge display AFR, and position P1 displays Lambda. If set to P4 the output will simulate a 0-1V NB sensor output that is compatible with the stock ECU. First, connect a laptop to the ECU and open MEITE. Bring up the WBO2 calibration table by double clicking WBO2 HRT in the Tree View. Input the values shown in the picture below & start the car, checking that the WBO2 Current AFR matches the value displayed by the gauge. If not, you can adjust the HRT table in small increments until they match. The gauge output is normally displayed as an air to fuel ratio by mass. For petrol fuel, the stoichiometric ratio (stoich) is 14.7 parts air to 1 part fuel; this means for an engine to completely react 1gram of fuel it needs 14.7 grams of air. Of course, this assumes that each particle of fuel is nicely surrounded by air so the combustion can be 100% effective, which it’s not. If there is less air than stoich then the mixture is called rich; if there is more air then the mixture is called lean. Naturally aspirated engines will usually make peak power with an AFR of around 13-13.5:1, this extra fuel ensures all of the air is reacted in time; the excess is only partially reacted. For idle and cruise, where fuel economy is much more important, the AFR can be set to 14.7:1 or in some cases even leaner. Some engines have no trouble running as lean as 16:1; leaner than this and the spark plug will have difficulty igniting the sparse mixture. An important role of injecting fuel into the engine is cooling the combustion chamber and piston crown. When the fuel is injected into the port it is still in a liquid state, when it is pulled through the intake valve the heat of the cylinder turns the fuel into a vapour. This change from liquid to gas pulls significant heat from the surrounding components. Running lean at high loads causes the piston to heat up and pre-ignite the fuel, or if it get too hot it can melt. Below is a default target AFR table with load (in kPa) on the y axis and rpm on the x axis. At higher rpm there is less time for the piston to cool so the mixture is slightly richer for more cooling. At full load the combustion process is hotter and power is more of a priority so the mixture is run richer. When the engine is cold the fuel cannot effectively turn into a vapour so it is more difficult to ignite, to stop misfire extra fuel is injected; this is why the AFR is usually 11.5-13:1 when the car is started. WBO2 sensors need to be at a specific temperature to give an accurate reading and for that reason they have internal heating elements to bring them up to temperature faster. It can take around 15s from powering the sensor to it giving an accurate reading; this is why the gauge will often read 14.7 when the car is started, even though the mixture is much richer.